The Baltimore Architecture Foundation in coordination with the Havre de Grace Arts Collective presents an “Early Women of Architecture in Maryland” exhibit at the Opera House and” Poldi Hirsh – The Artistic Vision of an Early Modern Architect” exhibit at Concord Point Coffee in Havre de Grace. The Exhibits runs October 1 to November 30. Receptions are on Thurs., October 11 from 6-8pm at the Opera House and on Saturday, November 3 from 2-4pm at Concord Point Coffee (217 N. Washington Street, Havre de Grace). 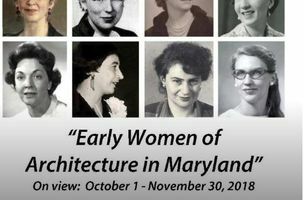 The “Early Women of Architecture in Maryland” exhibit delves into the history of 12 women who contributed their design talent to the built environment in Maryland at a time when few women were in the profession. The travelling exhibit was developed under the guidance of the Baltimore Architecture Foundation with assistance from the Baltimore Chapter of American Institute of Architects (AIABaltimore), and has been showcased in numerous jurisdictions across the State. One of the women featured, Poldi Hirsch, was the first women corporate owner in AIABaltimore and a resident of Havre de Grace. She designed numerous mid-century modern buildings in the area. A special complementary exhibit at Concord Point Coffee of her artwork and architectural drawings will highlight her pioneering legacy.